HIGH TECH MEETS HIGH TOUCH. Precise, targeted brain tumor treatment. More accurate. Better results. Less time. Treating brain tumors requires absolute precision, because every bit of healthy tissue helps make you who you are. And nothing provides more precision than Gamma Knife stereotactic radiosurgery, especially in the hands of a caring, superbly skilled and experienced team of neurosurgeons and radiation oncologists. Unlike other forms of radiation, which are aimed at a larger area or the entire brain, the Gamma Knife focuses treatment on the exact location of the tumor or abnormality, using computer imaging. It provides sub-millimeter precision of less than .3mm (about the width of a human hair), so healthy tissue is spared while a tumor-destroying dose is delivered exactly where it is needed. 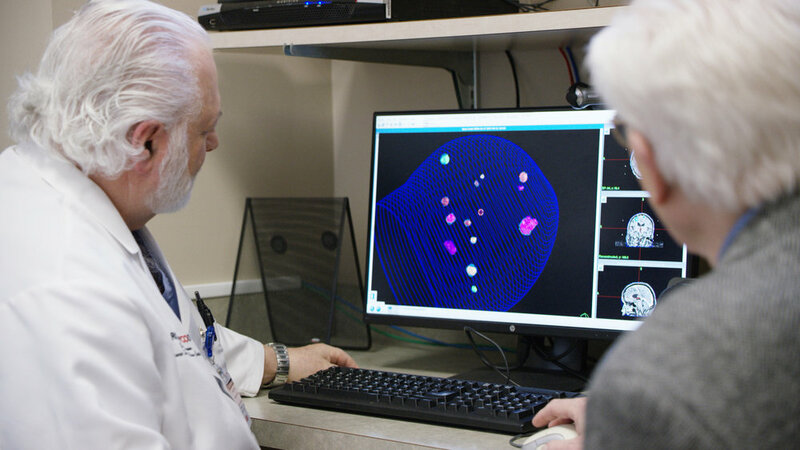 Treating brain tumors and other conditions in the brain requires absolute precision, because every bit of healthy tissue helps make you who you are. And nothing provides more precision than Gamma Knife stereotactic radiosurgery, especially in the hands of a caring, superbly skilled and experienced team of neurosurgeons and radiation oncologists. Our treatments are a one-day procedure that requires little or no anesthesia. You or your loved one will be treated in the morning, and in most cases (approximately 98% of patients) can go home that afternoon. The patient usually returns to normal activities the next day or within days of treatment. Our highly-skilled nurses are available to help answer any questions you may have. They can also help you schedule your appointment. By delivering sub-millimeter accuracy (about the width of a hair) the Gamma Knife delivers a therapeutic dose in one session, protecting healthy brain tissue that makes you the person you are. This accuracy is significant when it comes to sparing healthy brain tissue during these very delicate procedures. We provide an upbeat and positive environment where you are welcomed and treated with dignity, respect and a smile. We have an open door policy for patients' families. They are welcome in the preparation rooms and to accompany patients into the Gamma Knife area until we begin treatment. Our collaborative research team of neurosurgeons, radiation oncologists, neuro-otologists, and medical physicists consistently modify and implement our unique database enabling our research team to longitudinally study patient outcomes. TOP 10 GAMMA KNIFE CENTER IN THE U.S.
Gamma Knife of Spokane ranks in the top 10 Gamma Knife Centers in the U.S. for published clinical research and patient volumes, so you can feel safe in the hands of our superbly skilled and experienced team of neurosurgeons and radiation oncologists.